Something Borrowed tells the story of Rachel, a young attorney living and working in Manhattan. Rachel has always been the consummate good girl---until her 30th birthday, when her best friend, Darcy, throws her a party. That night, after too many drinks, Rachel ends up in bed with Darcy's fiancé. Although she wakes up determined to put the one-night fling behind her, Rachel is horrified to discover that she has genuine feelings for the one guy she should run from. As the September wedding date nears, Rachel knows she has to make a choice. In doing so, she discovers that the lines between right and wrong can be blurry, endings aren't always neat, and sometimes you have to risk all to win true happiness. 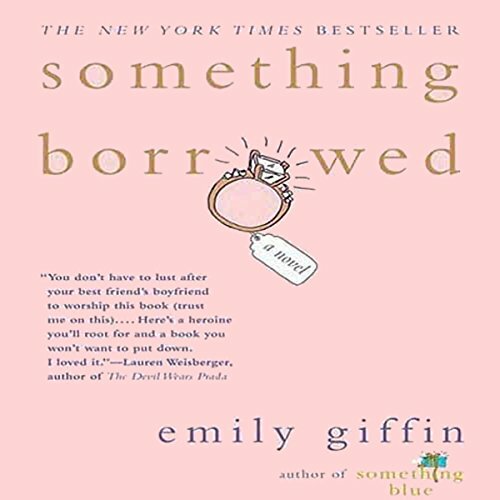 Something Borrowed is a phenomenal debut novel that will have you laughing, crying, and calling your best friend.